Does the restaurant lighting in your Tampa restaurant help or hinder your net profits? The clientele that comes to your Tampa, Florida restaurant is looking for three things: great food, attentive staff, and a welcoming atmosphere. 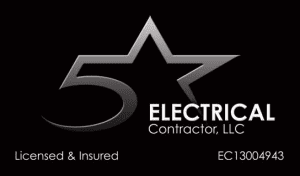 At 5 Star Electrical LLC, we can’t help you with the food, but you probably have that well under control. We can, however, provide quality restaurant lighting that can make it easier for your staff to work and also make your restaurant more welcoming. Restaurant Lighting for Customers – There are many ways in which restaurant lighting can make or break your establishment. The right lighting can make your delectable menu items look appetizing, but the wrong lighting can make them look almost unpalatable. You can have the best presentation ever, but bad lighting above the tables will ruin it completely. Additionally, attractive restaurant lighting fixtures will draw attention and add to the ambiance of your restaurant. Lighting that is dimmable is also important, so you can provide a romantic atmosphere when desired. Restaurant Lighting for Staff – The lighting in the kitchen and other prep areas is important, too. Your staff cannot be efficient, and thus be seen as attentive, if they cannot easily see what they are doing. Poor lighting can result in grabbing the wrong items, which won’t impress the customer one bit. Let us help you revamp your restaurant lighting, so it puts your restaurant in the very best light. Our aim is to improve your customers’ dining experience so they’ll become regulars, thereby making your restaurant the most profitable it can be. Call us today to schedule a time that is convenient for you, so we can assess your needs and give you solid, honest advice about improving your restaurant lighting.